” Greetings from Benin and thank you for all the news. In the wake of the tragedy in the U.S. school, we must indeed pray for peace and do all we can to promote it in our own ways. Thank you so much to Rebecca and the children for coming together in Peace. We also look forward to further collaboration with this school. Thanks so much to Donna Cox for connecting us to Fiona Kennedy whose two sons have created this design for Benin. 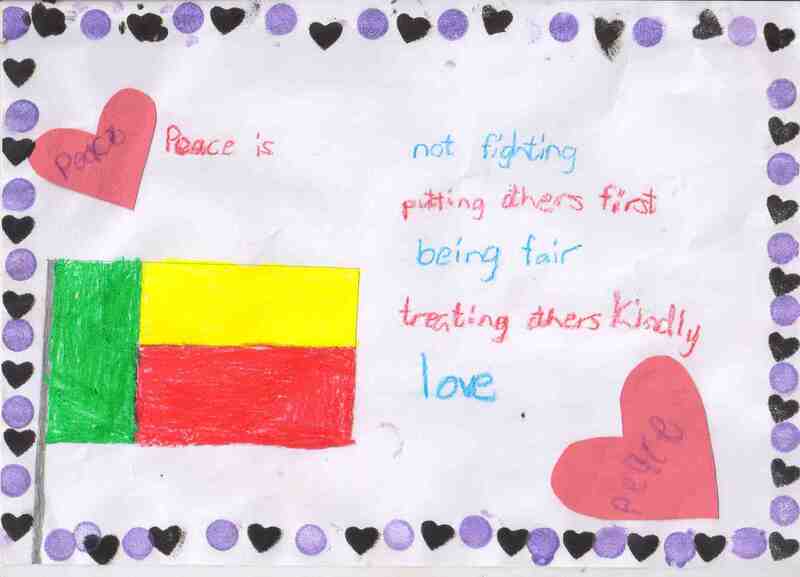 We are delighted to have a wish for Peace from Benin included.Well done to the boys. The colors of the Benin flag are explained in the Benin’s national anthem as such – the green represents hope and revival; the red symbolizes the courage of ancestors; and the yellow represents the country’s wealth. The colors are traditional Pan-African colors.The Country was names Benin in 1975.